In this letter Martha Berry thanks K.P. 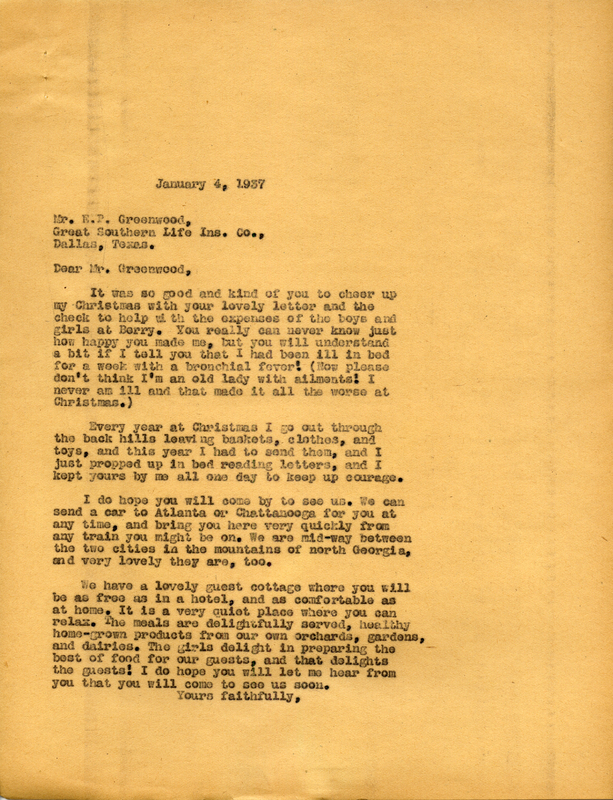 Greenwood for his encouraging letter at Christmas. She tells him that she has a bronchial fever but that she is not a sickly old lady. She then invites him to visit the Berry schools. Martha Berry, “Letter to Mr. K.P. Greenwood from Martha Berry.” Martha Berry Digital Archive. Eds. Schlitz, Stephanie A., Jordan Brannen, Jessica Hornbuckle, et al. Mount Berry: Berry College, 2016. accessed April 19, 2019, https://mbda.berry.edu/items/show/14248.